Baroque dance is the conventional name given to the style of dancing that had its origins during the seventeenth century and dominated the eighteenth century until the French Revolution. Louis XIV was a major influence in its development and promotion. Even at the age of fourteen, Louis was an accomplished dancer: as the sun god Apollo in the ‘Ballet de la Nuit’ (1653), he became Le Roi Soleil, an image that he was to cultivate throughout his life. His courtiers were expected to dance in the his new style at the formal balls, and they performed in court ballets, in rather a similar fashion to what was considered appropriate to Stuart court masques. During 17th century dancing had not only a great social importance, but could also carry political importance. In 1661, Louis founded the Académie Royale de Danse. 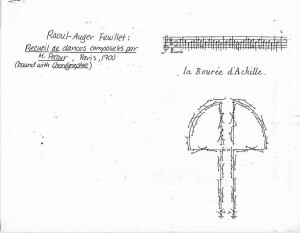 This academy was responsible for devising a system of notation (first published by Raoul Auger Feuillet in his book Chorégraphie in 1700) to enable dancing masters more readily to assimilate the new style of dancing and to learn new dances. It became customary to publish each season’s new dances in this notation, in readiness for performance at court balls and other grand occasions. While the French style of dancing had prominence throughout most of Europe (including Britain, Germany and Russia), contemporary Italy saw the parallel development of a distinct Italian style continuing Renaissance traditions of dance. This area remains to be thoroughly researched, but in 2004 Barbara Sparti edited the manuscript of Ercole Santucci’s manual of 1614. Dancing masters in Italy were described as either ‘French’ or ‘Italian’ in accordance with the style they specialised in. Various styles of eighteenth-century dance existed: ballroom, ballet, a number of traditional styles of theatrical dance, regional differences. The French noble style was danced both at social events and by professional dancers in theatrical productions such as opera-ballets and court entertainments. Other styles included the comic/ grotesque and mixtures of comic and serious. At the Académie Royale de Danse, where professional dancers, both male and female, were trained. The most distinctive features of the new style were the complex use of arms raised in opposition to the foot, the turnout of legs and feet and a rise to mark the beginning of the step. An important discussion of the preliminary plié and rise is to be found in Ken Pierce’s article, ‘Saut what? (Sauts in early eighteenth century dance)’, Proceedings (Society of Dance History Scholars) 11th annual conference, 1988. The same step vocabulary was used in social and theatrical dance, but it was in the theatre that the most demanding and complicated steps were seen. Professional male dancers could execute aerial beaten steps such as entrechats six and cabrioles. La Camargue or Camargo shortened her skirt to show off her footwork. Such dancing was the immediate precursor of classical ballet, which inherited the range of step-names while developing the actual steps, sometimes beyond recognition. Social dancing too required skills of footwork, upper body movement and timing. Complex dances were often popular adaptations from the stage. By this time, the left foot start that marked Renaissance dances, had been abandoned in favour of beginning steps on the right foot. However, couples dancing a duet would relate to each other in mirror symmetry, the male dancer starting on his right foot and the female on her left. The standard notation outlined the floor pattern as a continuous line divided into musical bars. Alongside are placed the symbols for the required steps. This system could become immensely complex for specific dances. To learn how to do the actual steps, we have to consult the dancing manuals of the period (see below). The placing of the arms was not generally notated, but certain rules applied which were described in the manuals, and the dancers could choose the most appropriate ones to follow for each dance or devise their own system. Floor patterns were generally made up of flowing symmetrically curving lines, “the line of beauty”, with dancers relating closely together, coordinating both steps and hand movements. A wealth of information enables researchers and dancers to reconstruct dances from this period with a fair amount of accuracy, although interpretative differences are legion. duple rhythm: bourée, gavotte, rigaudon, etc. compound duple rhythm: canarie, forlana, gigue, etc. French contredanses (the French adaptation of English Country dances) were given in simpler notation. Fleurets or pas de bourrée were generally used, with full notation only for more unusual steps such as pas de rigaudon. Informal Baroque dance site including an extensive collection of links and HTML versions of some dancing manuals. Low traffic mailing list mostly used for announcements, but other relevant content is welcome. P. F. Beauchamps, Recherches sur les théâtres de France (Paris, 1735). E. Fairfax, The Styles of Eighteenth-century Ballet (Scarecrow Press, 2003). F. de Lauze, Apologie de la Danse (1623; facsimile, Genève, 1977; translation, J. Wildebloode, London, 1952). R. A. Feuillet, Chorégraphie (Paris, 1700; facsimile, New York, 1968). G. Lambranzi, New and Curious School of Theatrical Dancing, facsimile, trans. D. De Moroda, ed. C. W. Beaumont (Nuremberg, 1716; Mineoloa, NY: Dover, 2002. B. de Montagut, Louange de la danse (ed. and trans., B. Ravelhofer, Cambridge & Tempe, 2000). J. G. Noverre, Letters on Dancing and Ballets (Lyon, 1760; Trans. C. Beaumont, New York, 1966). L. G. Pécour, Recueil de dances (Paris, 1700; facsimile, Farnborough, 1970). J. Weaver, Orchesography (English version of Feuillet, London, 1706; facsimile, Farnborough, 1971). J. Weaver, A Small treatise of time and cadence in dancing (London, 1706; facsimile, Farnborough, 1971). P. Rameau, Le Maître à danser (Paris, 1725; facsimile, New York, 1967). J. Essex, The Dancing Master (English version of Rameau, London, 1728). E. Santucci, Mastro da Ballo (Dancing-master), 1614, ed. Barbara Sparti (Olms, 2004). K. Tomlinson, The art of dancing (London, 1735). 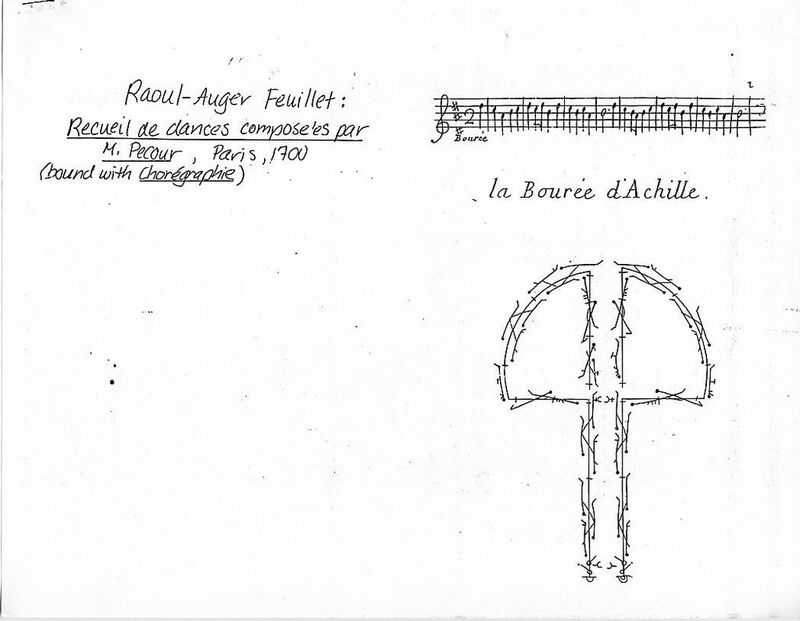 Other primary sources for French Baroque dance are listed by W. Hilton, cit. below. J. Appleby & P. Waite, Beauchamp-Feuillet Notation: a basic guide (Cardiff, 1998). Edmund Fairfax, The Styles of Eighteenth-Century Baroque Dance (Scarecrow Press, 2003). W. Hilton, Dance of Court and Theater: The French Noble Style 1690-1725 (Princeton & London, 1981; 2nd ed., Dance and Music of Court & Theater, Stuyvesant, NY, 1997). K. Pierce, ‘Saut what? (Sauts in early eighteenth century dance)’, Proceedings (Society of Dance History Scholars); 11th annual conference, 1988. R. Ralph, The Life and Works of John Weaver (London, 1985). For general books on historical dance and instruction-books and practice tapes see Additional Resources. The video Baroque Dance (Music, Mind & Movement, 1998) features ten representative dances. See Learning the Dances for details of instruction-books and recorded music produced by the Dolmetsch Historical Dance Society (now HDS Historical Dance Society), by Nonsuch Productions and others. These give interpretations of how to dance many of these dances, along with their music.